SetupServer provides 1-click SSL feature. Just follow this tutorial to install SSL on your Website. First Login to your Setupserver.io Account and then select the server. Now select the application from the dashboard on which you want to enable SSL. After selecting the desired application you have to choose website domain name to enable your free SSL. If you don’t have any domain name then purchase one from any domain provider like GoDaddy or BigRock. Add your website by clicking on add website button and enter your new domain name. If you are facing problem in adding your domain name to SetupServer. See our documentation – Add Website to your App. If you have already purchased it and added to the application at the time of creating one, your website name will be displayed in the list. Now click on “More” button on the left side of your desired website domain to open a drop down list. Select “Enable SSL” and you will be prompted with a modal box for selecting SSL type. 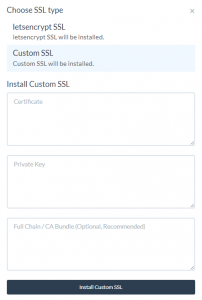 LetsEncrypt SSL will automatically install and configure your SSL certificate in just 1-click and it’s free. 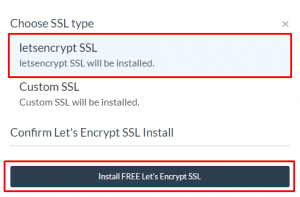 Select LetsEncrypt SSL in modal and click on “Install Free Let’s Encrypt SSL” button below. Now you can relax while SetupServer configures your SSL. While if you already have configured SSL certificate with you, you can add it with our Custom SSL feature on your desired domain. Certificate – contents of SSL certificate. Private Key – private key used to generate SSL certificate. Full Chain or CA Bundle – contents of a file containing root and all intermediate certificates. It is optional. After filling all the desired details click on “Install Custom SSL“. Sit back while we configure your SSL on your domain. After this successful completion, the page will be refreshed and your SSL certificate is now enabled on your domain. You can check by visiting your website URL by https://YOUR_WEBSITE_DOMAIN_NAME.